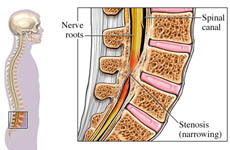 Lumbar Spinal Stenosis is the narrowing of the spinal canal that puts pressure on the spine cord. It can also be a narrowing of the area where the nerve branches exit the spinal column, thus causing lower back pain or pain that radiates down the legs. Stenosis of the spine can be a painful and debilitating problem that often affects individuals 40 years of age or older. It can develop in both the cervical and the lumbar areas of the spine. Most research suggests that it affects men and women equally in the lumbar area. In some cases spinal stenosis is congenital; there can be imperfections in the development of the segments of the spine. In most cases it is just part of the aging process with various conditions contributing to its development, such as a herniated disc, osteoporosis, calcification over growth, scar tissue build up or even a tumor. The level and intensity of the symptoms may be different for each person. The frequency and intensity will also vary. The condition itself does not necessarily mean you have to experience negative symptoms. However, when coupled with inflammation, poor posture and the activities of daily living that strain the back, once can certainly experience the symptoms of pain, numbness and stiffness (which are all also symptoms of Sciatica). To be diagnosed with spinal stenosis, your primary care physician will go over your medical history and conduct a physical examination. During the physical exam, you likely will be asked to do a few simple physical tests so your doctor can see if your range of motion has been affected. You will also be asked to answer some specific questions about your symptoms. In addition, any of the following tests may be used to help properly diagnose this condition: x-rays, MRI, CAT scan, myelogram and bone scan. A common treatment for spinal stenosis is to restrict movement. Corticosteroid injections may help reduce the swelling. Commonly used drugs include acetaminophen (Tylenol), non-steroidal anti-inflammatory drugs (NSAIDs), Non-drug treatments include hot packs, ultrasound, electrical stimulation and therapeutic exercises. Stimulating blood flow using massage or a hot tub may also help. If your condition does not improve after this kind of treatment, surgery may be an option. Why do Traditional Treatments Fail? The first thing to do is make sure you get the very best and most up-to-date information you can on the condition, including your own experimentation with what you can tolerate and what works best for you. There maybe some missing links in your treatment plan, so never stop learning and trying new things. Everyone with spinal stenosis has trigger points and everyone should have a way to administer self trigger point therapy everyday, immediately followed by muscle balance therapy to restore balance and proper function of the muscles and joints. Learn to take time for yourself and relax. The use of far-infrared heat can help immensely, as it is deep-penetrating and dramatically improves the blood flow to the area in question for very quick relief and improved range of motion. The use of ice and or heat can help control inflammation, pain and stiffness. 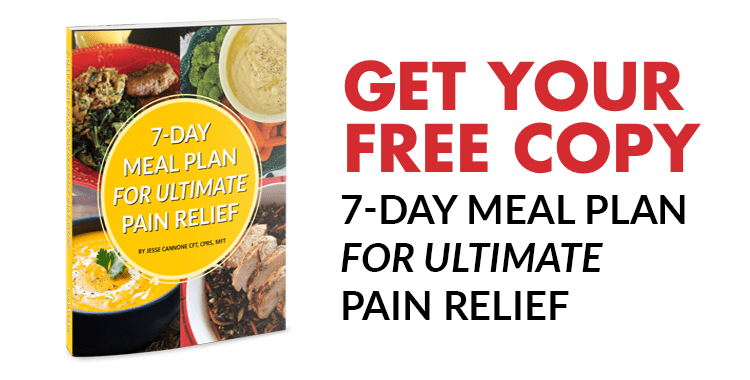 Other natural approaches, including proteolytic enzyme therapy, can be of benefit to help control the symptom of the condition. 50 Years of Back Pain Gone in Just Days! Jerry Talisman had suffered from chronic back pain on and off for over 50 years. Like most people, he had tried it all… chiropractors, physical therapy, he even overdosed on tylenol but nothing gave him lasting relief until he discovered muscle balance therapy.